We know that mobile is changing live music. But how are mobiles apps evolving? Are they evolving in the right way? Let’s take look and see with this quick trip through this Billboard article by Elliot Van Busskirk. Then I’ll offer up a 5 Elements that I think should be on the perfect concert mobile app. The Billboard article focuses on 5 apps that are empowering fans, bands and venues owners to get more engagement out of the concert experience. Since we’ve explored the senses many times before, my favorite part of the article is the section about using apps to measure our body’s physical response to live music. Measuring movement is an easy one. A band could also lend out gizmos for measuring heartrate, skin moisture, eye direction, or anything else the body does as a response to music, and use that as another input to then feed back into the music, lights, or both. My favorite litmus test for music is anything that makes my arm hairs stand up on end, but that’s just one of the body’s biological responses to liking, hating, or otherwise experiencing music. Doodads that can measure that stuff are getting cheaper all the time — or, if they’re not, a band could select just a few fans to get these devices, or maybe require that you let them hold your driver’s license. The point is: biofeedback, even though it’s sort of creepy, could make shows a lot more fun while literally getting the fans more involved. Elliot and these app developers are on the right path, but after reading the article and thinking through our other mobile experiments I’ve been wondering about a few things. If we could create the perfect concert mobile app, what would be the most important elements? What kind of concert app would revolutionize the concert experience and successfully meet the concert fans, bands and venues owners? Not just function but also DESIGN. It’s no longer sufficient to create a product, a service, an experience, or a lifestyle that’s merely functional. Today it’s economically crucial and personally rewarding to create something that is also beautiful, whimsical, or emotionally engaging. Not just accumulation but also MEANING. We live in a world of breathtaking material plenty. That had freed hundreds of people from day-to day struggles and liberated us to pursue more significant desires: purpose, transcendence, and spiritual fulfillment. What Do Fans Really Want (And Need)? I like what Pink says in other parts of his book about incorporating meaning into the creative mix because I’ve had several chats with fans and app developers like Alex with StagePage about how a well designed mobile app should allow fan to get more significance from their concert experiences. This are all questions I think about all the time. And I’m sure many of you have begun to ask them already in various ways. And I predict that seeking our more meaning and significance to our concert experiences and wanting to share those emotional discoveries with our friends and family will be an emerging trend and more fans will desire to derive meaning from our concert experiences. And that’s why we need to start thinking of ways to help fans put more meaning to the millions of videos, tweets and photos they’re producing during shows. 1. Make it simple to measure and record. In order to foster adoption, the perfect concert mobile app should ask users to take simple steps that are a natural part of the concert experience. Give fans a way to easily enter our mood and emotions before, during and after a show. Simplicity is key to any mobile app, especially when you’re trying to get concert fans to take specific actions. The best task management apps do a great job of making it simple to quickly record information and make it easy to retrieve it later. I’ve been following other experiments like this one and I hope this type of mood-tracking functionality gets included in the perfect concert app. And besides making it simple to use, this app should be fun, viral and social. More on that in a moment. 2. Make the data meaningful. Put the data in context so fans can understand how the music is making us feel during the show and how that single moment changed our life. I’ve been experimenting with Fitbit and I love how the process of looking at my health data helps to put my other daily habits in context with a simply dashboard. We should do something similar for concert fans. And if bands and venues owners could access use a mobile app to get more accurate behavioral analytics about their fans during shows that would be a game-changer too. 3. Gamify. The psychological power of using games has been proven successful in many industries and disciplines. And the concert experience has numerous opportunities to make going to a concert one of the most engaging and addictive gamified moments in our lives. Whether it’s loyalty points and rewards offered by venue owners for fans who check-in using functionality similar to Foursquare, or letting fans compete against each other during shows for completing certain actions, we need a concert app that gamifies the live music experience and adds value too. 4. Make it social. We know the power of using social media during concerts, so this element is a no-brainer to include on this list. However, I do mention it because we’ve only just begun to realize the true potential of social media within the concert experience. And I’m talking about creating a new type of social experience with this app. Just imagine if fans started sharing and tweeting contextual emotional data during shows. But instead of it just being hard and meaningless data, we were able to tell a story with it and enable concert fans to share their unique story – what and why they felt the way they did during a show – with their friends, family and fellow fans. If I could go-back and take a mood-enhanced and emotional data-enriched snapshot that showed me how the music, the crowd and my emotional response all contributed to create the “wow” during the show, I would love to see what an experience like that would reveal to me about what I felt during my favorite shows. That’s something I would love to share on my social networks. And a story like that is way more engaging and viral than just the normal tweeting we already see during shows. That’s why we need to have a mobile app that transforms what “being social” means during a concert. 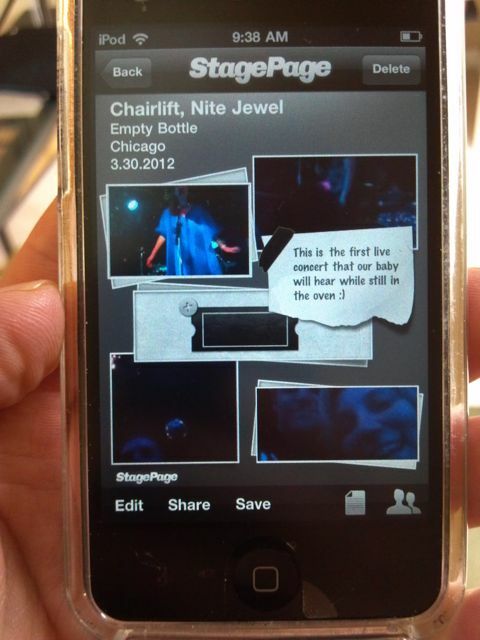 And we can do that with emotional and contextual storytelling with the perfect concert mobile app. 5. Tell a story. We’ve already touched on this element, but I mentioned it again because this fifth element is the most important as it relies on the seamless integration of the previous four. However big or small, the app should combine all the other 4 elements to tell the fan something new and emotionally meaningful about themselves or the other fans around them. Whether it’s a simple data dashboard, competitive leader boards, badges, the story should be the data, a contextualization and a synthesis and synchronization of all the previous four elements. And by bringing all these elements together we will give the concert fan the ability to understand themselves better, get more meaning fromt their concert experiences and give fans the ability to tell a complete story that can’t be told anywhere else. If there’s one thing that I’ve learned over the year on Live Fix, it’s that we all love to listen to and tell stories. And concerts are full of stories. And the perfect concert mobile app would be an excellent storytelling machine. We’re dreamers and visionaries here at Live Fix and without a doubt these 5 elements I believe are the future of concert apps. Yes, these are concepts. And some of these might be hard to pull off right now. But you can’t deny the fact that we have a great opportunity to engage concert fans in a way that in new and exciting. We don’t need another concert mobile app that syncs with our iTunes playlist or finds the closest concert. There’s enough of those clogging up our mobile phones already. We need a concert app that will truly empower fans, bands and venue owners. We need a concert app that will push the concert experience forward. I believe we aren’t that far away from seeing an app developed that has all these 5 elements. And once we do create the perfect concert mobile app, I wish we could go back and use it to explore and rediscover these concert fans stories again in a whole new way. What apps are you enjoying? What would you add to our list of features on the perfect concert app? Share your mobile app concert experiences and thoughts in the comments below, or call the concert fan hotline at 773-609-4341, and we’ll include them in a future episode of Live Fix Radio.